Due to the reduced flexibility the FunLine can be set up very low to the ground significantly reducing the risk of usage, which makes it ideal for beginners and children. In addition to this the rubber coated print adds more grip to the line when attempting your first steps. As a result, the FunLine was awarded Second Place in the Toy Awards 2009 in the category "Toy of the Year". Due to the reduced flexibility the FunLine can be set up very low to the ground significantly reducing the risk of usage, which makes it ideal for beginners and children. In addition to this the rubber coated print adds more grip to the line when attempting your first steps. As a result, the FunLine was awarded Second Place in the Toy Awards 2009 in the category "Toy of the Year". 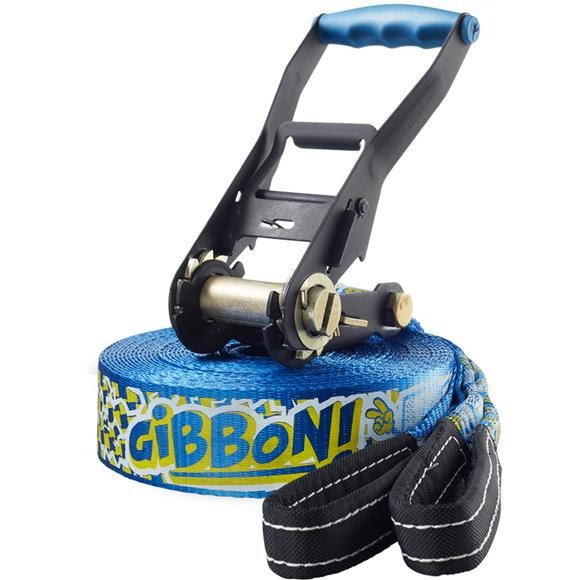 With an integrated ratchet cover (RATPAD) the set complies with German industry standards for slacklining (DIN 79400) and the German TUV standards. Learn to Slackline with the free Gibbon Slackapp! Get your Slackapp: To install simply search for "Gibbon Slacklines" in your trusted iTunes- or Playstore.